If you are looking for some serious study and research on conversion and how that helps your evangelism work, this book contains it. Realizing that members of the church were not intentionally discipling others, I began searching for the reasons why. I read many books on the needs of unbelievers, and I examined studies that contained massive amounts of data about the spiritual beliefs of unbelievers. I also scrutinized church growth methods and examples in order to learn how to attract others to Jesus. All of my searching was informative, yet something was missing. The book reveals the results of a nationwide survey on the conversion process. Some of the results are surprising. Based on the findings, a process for making disciples is introduced and explained. . . I determined that I would uncover the mysteries of discipleship by asking people about their conversion process, so I conducted a nationwide study to better understand how people became followers of Jesus. I hypothesized that people are led to Jesus when there is someone who takes a special interest in their salvation. My thesis was that this person is especially influential in the lives of unbelievers when his or her life reflects Jesus, the greatest teacher of disciples. The results revealed that, indeed, individuals were influenced to commit their lives to Jesus by people who modeled Jesus in their lives. The research that Shawn has done into understanding the conversion experience gives us key insights as evangelist. With the support of good research methodology, vivid illustrations from his life on the Alaskan frontier, and anecdotal examples from his own discipling ministry, Shawn Anderson carefully lays out solid, practical Biblical principles for leading others to Christ. I grew up in North Pole, Alaska, and presently live in Oregon. I am a follower of Jesus, loving husband, and involved father. I have worked as a minister, professor, author and consultant. I have also planted a church in Russia. I hold a doctoral degree in Organizational Leadership from Pepperdine University. My mission in life is to lead people to Jesus. 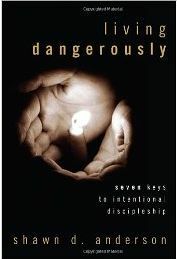 I am the author of Living Dangerously: Seven Keys to Intentional Discipleship, published by Wipf and Stock. To be automatically informed as to our next webinar, sign up for our Free Evangelism Newsletter. If you will add this as an event on the Missional Outreach Network, I’ll send an invite out for this to all of our members on the network. Thanks for offering this. I hope that we can get our schedules together soon.